21 Jan 2019 --- Whether your body stores fat around the trunk or in other bodily parts is highly influenced by genetic factors and this effect is more predominant in women than in men. This is according to a recent study from Uppsala University, published in Nature Communications, which measured how fat was distributed in nearly 360,000 voluntary participants. “We know that women and men tend to store fat differently – women have the ability to more easily store fat on the hips and legs, while men tend to accumulate fat around the abdomen to a higher extent,” says lead author Mathias Rask-Andersen, Ph.D. and postdoctoral researcher at the department of Immunology, Genetics and Pathology at Uppsala University. The study was based on data from UK Biobank, a cohort study of half a million participants in the UK. The participants gave blood samples for genotyping and the distribution of fat tissue was estimated using impedance measurements, i.e., measurements of electrical resistance when an electrical current is fed through the body. Millions of genetic variants across the genome were tested for association with distribution of fat to the arms, legs or trunk. The researchers identified nearly a hundred genes that affect distribution of adipose tissue to the different compartments of the human body. The researchers also saw a high degree of heterogeneity between sexes. “We were struck by the large number of genetic effects that were stronger, or only present, in females. Upon closer examination, several of the associated genes were found to encode proteins that actively shape the extracellular matrix, which makes up the supporting structure around cells,” says the group leader docent Åsa Johansson. The findings suggest that remodeling of the extracellular matrix is one of the mechanisms that generates differences in body fat distribution. Fat stored in the trunk has previously been associated with increased disease risk. 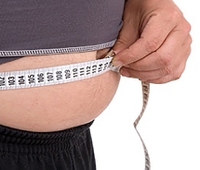 Men have a greater amount of abdominal fat than women and this may explain the increased prevalence of cardiovascular disease observed in males. Epidemiological studies have even shown that the ability to store fat around the hips and legs gives women some protection against cardiovascular diseases. The result of the current study may, therefore, lead to the development of new interventions to reduce the risk of cardiovascular disease. Commenting on what these findings could mean for personalized nutrition options, Rask-Andersen says he sees no definite uses at the moment. However, these traits have not been studied on this scale previously and something may turn up in future studies. “A precision diet that is based on genotype information is certainly an interesting concept. Resources such as the UK Biobank should be an excellent resource for such studies,” he notes. “Our focus will be on genes that we can relate to adipocyte function, i.e. the cell that stores fat in the human body. The goal is to produce functional models that can explain the genetic associations that we see,” Rask-Andersen concludes.